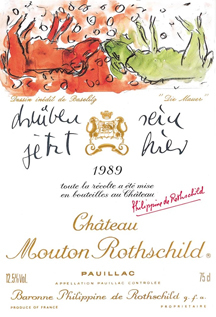 This entry was posted in Wine and tagged Corked wine, Imperial, Mouton Rothschild, TCA by Benjamin Lewin. Bookmark the permalink. Great subject matter. Fascinating ! I don’t think that TCA would diffuse all that slowly over 25+ years of storage, since the diffusion coefficient is proportional to MW^1/3. If that were true, then flavor compounds would also diffuse differently. Nor would TCA (MW 211) set up a concentration gradient during the time the bottle was set up. I can think of several possible explanations: (1) The TCA diffused out of the wine while it was open (I presume the wine wasn’t decanted). (2) The TCA was oxidized (perhaps by a Fenton reaction) while the wine was exposed to air (3) The TCA bound to the sediment, which sank to the bottom while the bottle was standing, a process analogous to fining. I leave out the possibility that your palate was overwhelmed by multiple glasses of three first growths in a single sitting! Interesting thoughts. I don’t think we can compare TCA with other flavor compounds, because those compounds would presumably be equally distributed in the liquid from the start, whereas TCA originates only in the cork. A more obvious comparison might be with oxygen, which enters through, or is released by the cork, but if diffusion depends on molecular weight as you indicate, the oxygen would diffuse for more rapidly. Pouring directly from an Imperial would be rather tricky, but assuming the wine was decanted into individual decanters, there would then be eight different possible pours from the first to the last decanter. I don’t think this would change the plausibility (or lack thereof) of differential location. Very interesting idea that TCA might be bound by sediment and would therefore be more likely to be removed at the bottom, but is there any evidence for TCA binding to other compounds in wine? It is extremely polite to put the possibility that the phenomenon was not in fact real by casting it in terms of palate fatigue, but immediately the wine was poured, people at the table were exchanging glasses to compare because some people had detected a problem while others had not. There was agreement that the glasses around our table definitely differed in extent of TCA. I entirely agree that the concept of differential concentration seems vaguely ludicrous, but I am confident that there were genuine differences between the glasses. Furthermore, the one sample that did not exhibit any cork taint when poured, developed it an hour later, which seems consistent with the notion of differential concentration (as opposed to some sort of muddle in which some glasses had TCA and some did not). I am mystified by the phenomenon, I raise the possibility of diffusion and differential concentration simply because no other more plausible explanation has been suggested, but I agree the whole thing seems most unlikely. (It is not a joke, however, that is really what was observed). Ubnfortunately it would not work with Coravin because Coravin takes its sample only from immediately below the cork. You have to tip up the bottle as the wine is taken out (in fact, this makes it a problem to use Coravin for old wines that have sediment). But it’s a very good idea because, after all, there’s no objection to opening the bottle, so you could take samples from different positions using a tube and a siphon-like arrangement. I will be glad to conduct the experiment if someone will provide Imperials! I am struck by your observation that you have never detected cork taint on the cork itself. To say that you are vastly more experienced than I in all things wine-related would be a gross understatement. However, I recently had this experience: I had brought a wine from home (Sierra Foothills in California) to the southern Rhone to contribute to an informal blind tasting gathering of wine industry folks in the region. When I pulled the cork, I could immediately smell a little taint and sniffed the cork and found it quite clearly there. But I could not pick it up in the wine itself (a grenache-based blend). I went ahead and served it to a couple of the folks present. The first said nothing about cork taint, (but astoundingly identified the blend components and that it was Sierra Foothills, but he was a Frenchman who moved between California and CDP in his work) but the next, a very experienced American-French somm, picked it up, saying “there is something wrong with this wine”. After a couple more sips he said “Ah, too bad, its slightly corked”. So here was a case where the cork itself had a very evident aroma of TCA, but it took a sensitive (more sensitive than mine, anyway) palate to recognize its effect on the wine.